With our expertise we provide nest in class air curtains. Are Air curtains effective?Absolutely! All studies and tests have proven that air curtains are effective. When an efficient air curtain is well installed it save lots of energy and at the same time the entrance areas remain climate protected, comfortable and free of draughts, insects, odours, etc. A small, unheated 36-inch (91.4-centimeter) air curtain can cost as little as 9200 On the other hand, a high velocity, heated curtain for a 9-foot by 14-foot (2.7-meter by 4.2-meter) door can run almost 32500. What is a commercial air curtain?Because air curtains help to contain heated or conditioned air, they provide sizable energy savings and increased personal comfort when applied in industrial or commercial settings. Air curtains also help to stop the infiltration of pollutants and flying insects. 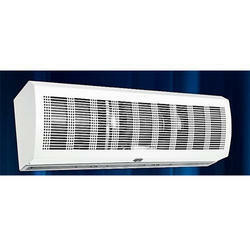 We are remarkable entity, engaged in offering superior quality Air Curtains. These curtains are installed at the entrance of the malls, hotels, shopping complexes, etc. These curtains are precisely manufactured in tandem with defined industry standards using supreme grade components and ultra-modern techniques by our dexterous technocrats. Owing to their perfect functioning, the provided curtains are widely acknowledged by our patrons. We offer these curtains at reasonable prices within promised time frame. All Metallic Casing - High in fire resistance, compact in over-all construction, convenient in installation, easy for cleaning and maintenance. Single Switch Button to control the High/Low Speed that can meet the need of various environments & door heights. Centrifugal Type Forward - Bending blade Wheel construction, fitted with efficient Volute design, rendering the capacity of the curtain for the best result. This type of wheel Is high efficient, less noisy, with large air volume (maximum air speed reaching 21 m/s). High velocity of this air curtain is unmatched by any other alr curtain in the market. Over Heating Protection - When motors temperature goes over the temperature (145c) the power supply will be automatically cut off and when the motors temperature decline (below 145c) it will start running automatically. 1200 mm Air Curtain -2 Double Bearing Motors & 4 Blowers.